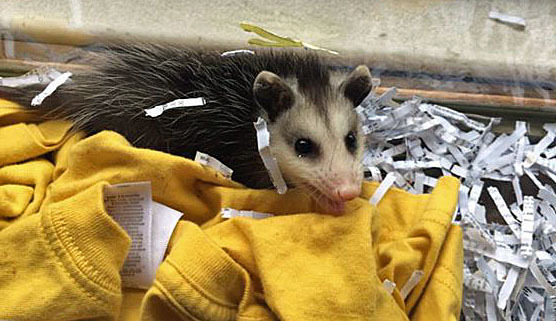 April 19: During a pre-dawn walk last week with Ranger she discovered an infant opossum alone on the parkway of the street one block over from where we live. It made an attempt to scamper away across the roadway, and I scooped it up before it could get to the other side and closer to a feral cat who was VERY interested in what was going on. I brought it back to where I found it and did my best to listen for either a mother opossum or some siblings, but hearing nothing I decided not to leave it to become a cat’s breakfast and instead to bring the critter home and care for it until the following weekend when I could take it to a far more qualified and licensed animal welfare organization. Well, the weekend came there were no rooms at the inns. All three that I contacted were either not accepting opossums outright this season or full-up. So we set up the healthy and uninjured opossum that I estimated to be about five or six weeks out of the pouch in a larger enclosure where it continues to eat heartily of the moistened cat kibble and banana we’re feeding it, and enjoy the comfort and privacy of snuggling up inside an old shirt inside an old shoebox most of the time. Awesum O’Possum during a visual check on April 16. 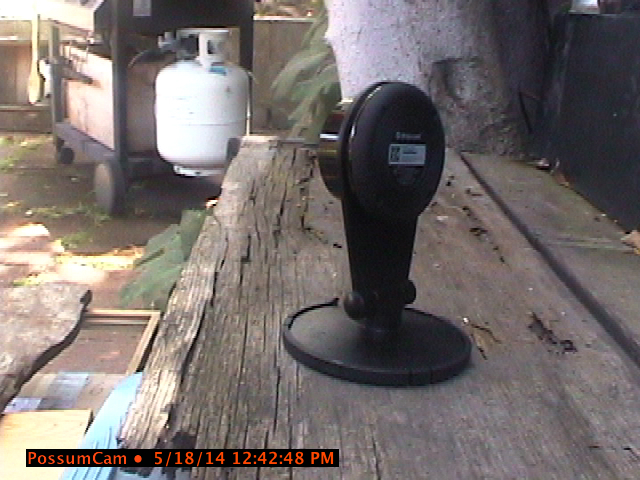 And today I finally set up the webcam to hopefully catch and snap a grainy low-res image of her (we think) whenever the reclusive gal ventures cautiously out for a sip or a nibble or a poop or a climb-about. Our goal is to nurture her for a release back into the neighborhood when she’s far better able to fend for herself. PS. Susan calls her Polly ‘Possum. I prefer Awesum O’Possum, said with a weak Irish accent, of course.